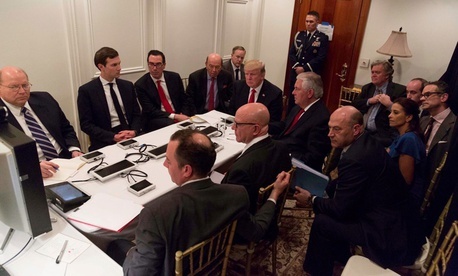 Analysis: Can This National Security Council Handle a Real Crisis? Should Military Men Draft Our Nation's Security Strategy? It’s hard to believe, but this administration has not experienced a genuine national-security crisis in more than six months in office. Yes, missile tests in North Korea and a boiling regional spat in the Middle East are spiking blood pressure across DC, but the most nightmare-inducing risks have originated in the president’s own social-media rhetoric, not the crises themselves. Recent turmoil within the National Security Council has been almost entirely generated by its own members, some of them newly former. While the people in the West Wing protest and sputter in response, let me put it this way: Have they moved their entire professional wardrobe to their file cabinet? Have they purchased underwear on Amazon because they don’t have time for laundry? Have they resignedly given their mothers the number to the White House Situation Room? Are they working late due to physical threats or just because the president tweeted again? Don’t worry, they’ll get their turn, and North Korea and others look more than willing to assist. Crises of the sort I just described are rites of passage for White House national-security staff, combining existential terror with physical deprivation and feats of strength; a marriage of, say, dread of annihilation with the bodily stress of Joey Chestnut at a hot dog contest. History offers many guideposts for understanding and solving the substance of international crises but, by and large, few include any hints on living through them. As a result, when stuff goes down, the people in the room where it happens are often very smart, very capable, and very overwhelmed, neglecting basics that will keep them, and the rest of us, alive. In a White House as chaotic as this one, these dynamics will only be exacerbated. We’d like to think that in a crisis the U.S. security apparatus comes together in a moment akin the end of Independence Day, but behind the scenes it’s often more like Derek Zoolander with a computer. No administration gets a national-security crisis “right.” Ultimately its members are only mitigating an ever-scarier menagerie of risks, which I will leave others to advise on. But, having lost some 400 hours of my life to the White House Situation Room as director and later a senior adviser on the National Security Council Staff, I can offer my hints about what Trump’s national-security team will almost certainly neglect or get wrong when coping with their own parade of horrors. Eat. The national-security diet is a strange one: gallons of coffee and stolen boxes of White House M&Ms replace canceled anniversary dinners, generally inducing weight-gain you can think of as the “NSC 15.” Crisis meetings will inevitably occur during meal times and decision-makers will find themselves clutching their rumbling stomachs mid strike-options briefing. Apart from individual discomfort, this is bad for national security. The most romantic and moving gestures I recall from my time on the NSC staff were people buying me sandwiches. If you’re getting one, get seven. Sleep. Lack of sleep is a sadistic badge of honor among national-security types (see: the midnight-hours classified email sent from one’s desk, or the “I don’t know what time-zone I’m in” diplomat back from marathon travel). Dark under-eye circles denote true dedication to the cause. But missing shut-eye can cause people in high-stakes situations to make catastrophic decisions, and jet-lag has famously led to some stupendously bad calls by diplomats just off the plane. Trump’s national-security team should keep making dates with their pillows, or at least bring one to the office. Hell, and national-security decision-making, is other people. National-security matters are, by nature, complex enough to require half a dozen government agencies just to build a Power Point slide. Building invitation lists for NSC meetings demands the dedication and logistical skills a D-Day planner. But there is an instinct in an urgent crisis, when time is short and brain cells are cranky, to skip all that and just address the matter at hand with whoever happens to be around—one’s special assistant, deputies, or coffee guy. This comes with several obvious costs—including the absence of informed decision-makers right when they’re needed—and it inevitably involves the diciest game of telephone ever (“Bomb? Oh, Guam!”), as you gradually tell all the people you left out. Lawyers, accountants, and flacks, oh my! Probably because it is their job to say why a course of action is crazy, the experts who work with the press, the Congress, the law, and the money tend to be the most easily forgotten when gathering people together in a crisis. There is nothing quite like their slow blink when told of a decision after the fact, with the accompanying need to “make it so.” After all, these are the men and women who take the lofty aspirations of ideologues and theorists and make them real. McMaster’s team should keep them on speed dial, if not ask them to sleep in the West Wing. Give listening a chance. This administration, for reasons that will be left to the history books or my Twitter feed, isn’t terribly inclusive even when its members have gotten the requisite amount of sleep and calories. As a rule, they have been keeping career bureaucrats at arms’ length and wondering why this is all so complicated. But I have a surprise: Upon becoming president, Mr. Trump and his advisers got access to a huge body of foreign-policy experts who exist to make their agendas work effectively! They do diplomatic advice! They can roll out plans for sensitive policies! They know about treaties! They even know where the lights are. Call them, maybe, and reap the benefits of people who might prevent you from, say, forgetting that the government of Lebanon is generally a fan of Hezbollah with a lightning fast pre-brief or catchy mnemonic. But nota bene: If West Wing denizens get particularly expansive and decide to involve, say, experts from an embassy or a military command in a far-flung locale in their deliberations, they should look at a clock. Will this video-teleconference require engaging with an ambassador or general in their pajamas? Some things cannot be unseen. And keep your friends close. While considering other time-zones, don’t forget America’s international friends. In a crisis, it is all too easy to treat America’s closest allies like a lovesick “back-up” date: someone who’s willing to sign up for anything at the last minute due to their undying affection. This is unwise. Any actions in a crisis that impact the interests of U.S. partners—or sign them up for specific actions!—merit early consultation, not a “heeeyyyyyy” after the cruise missiles have launched. This is nothing like 24. Visitors to the Situation Room will immediately notice it’s not nearly as high-tech and blinking as its Hollywood versions, and the enchantment keeps fading from there. America is a superpower, with access to tremendous capabilities, resources, leverage, and brains, but basically everything the United States might do to respond to a crisis is much harder and slower than you might imagine. As a result, the urge to skip over “required” steps in decision processes, or demand what is fast rather than what is right, is strong. Don’t give in. Especially in the war room. Prayers for patience are most needed when turning toward the Pentagon. Seeking military options from the Department of Defense is a delicate dance involving a sea of acronyms, a continuous escalation ladder of “your boss will need to call my boss,” and a civil-military philosophical battle that sounds like a chicken-and-egg debate conducted solely in acronyms. Even with an abundance of former and current senior military officials in senior national-security roles, marriage counseling advice is needed to at least smooth the relationship between White House and DOD officials. Open communication, being straight about needs and limitations, and giving one another time (as military planning takes about three months more than the two hours you are anticipating) are key to minimizing mutual feelings of mutiny. As is giving CENTCOM a heads up when you’re considering a strike on Syria. No impulse buying. Even with such understanding, folks on the national-security staff will frequently need to remind one another that, as Lieutenant General David Barno and Rosa Brooks remind us, the United States is not Super Walmart—or Amazon. The U.S. government frequently demonstrates its might by sendingstuff to hot spots: humanitarian aid to disaster areas, security assistance to partners in need, etc. Years of this practice have made the (wrong) impression: that the government can move anything, anywhere, overnight, and with free shipping. Despite its many fine qualities, however, the United States has not broken the laws of physics and must adhere to time, distance, and freight charge requirements. It’s not often possible to get there the firstest with the mostest, and if it is, it’s often with spare items to which American partners will offer an “er, thanks.” Decision-makers will need to temper their appetites and avoid prioritizing what’s easy—or most camera-friendly—vs. what is needed most. It’s ok to just not know sometimes. Nor can a decision-maker be all-seeing. With access to the most technologically superior intelligence network in history, it is difficult to understand that the intelligence community is not actually a Tony Stark program or the All Seeing Eye of Mordor: It does not have 24/7 access to every square foot of the earth or every spoken word at all times (nor should it). It doesn’t matter how many UAVs you request on the scene, some things will remain opaque to policy-makers who think they need to know. They have to get used to it. Proofread for your country. And when the decisions have finally been made, the memos signed, the announcement scheduled, keep slowing down. In a crisis, the world looks to the United States as a validator of what is actually happening and getting it right matters to prevent panic. When you’re moving fast, everyone shrieks that the 90 percent solution is fine and can you please just send it now! But careful attention should be paid to the absence of words like “no” and “never,” (or the conflation of “million” vs. “billion,” mixing up a head of state with a “glamour model,” including the wrong King Abdullah, etc.—not that anyone’s ever done these things). Take a minute to reread press releases and work through statements. Above all, don’t forget why you’re here. Without context, crisis response can feel like a paper chase, fighting to get a memo approved and forgetting the result of putting men and women in harm’s way. When the media is braying for a quote or a half-dozen allies are calling on the hour, it’s tough to ask how many diplomats will be pulled away from their usual missions, how many contractors it will take to support them, or how many intelligence analysts will be moved off their priorities to cover whatever course of action is selected. The metrics of evaluating national-security choices are strangely limited—boots on the ground, need for a supplemental, requirement for legal approval—and do little to convey true opportunity costs and risks. Policy-makers should not forget that there are people on the other end of all their strategic statements and tweets. And then what?